Calicat, as you will likely guess, is a calico kitty, and she lives far away out in the country with three other cats, one of which is her real brother, and two people, Toni and Wayne. They are so far out in the country that they have had a problem with people dropping off unwanted pets nearby. 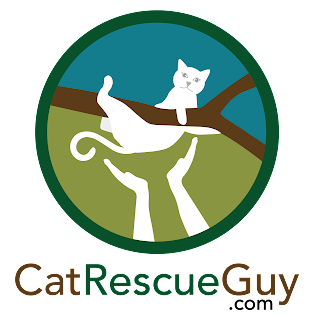 Recently, two cats were discarded on the road during the night, and they are probably the reason that Calicat was chased up a tree in her yard. 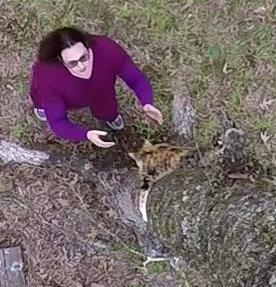 This is not the first time that Calicat has been stuck in a tree. In fact, she holds the record among all the cats I have rescued by being stuck in a tree five times. I never knew about her for the first four times, and each of those times she either fell out or managed to find a way down on her own. The fourth time, she was stuck in the tree for a hard-to-believe three weeks before she fell out. The only reason she survived that length of time in the tree was that there were rain showers every other day, and she was able to lick water off her fur. Toni told me that she also found her eating bugs, leaves and bark while in the tree. This time, her fifth time, she has been in the tree for seven days. Toni was unable to find anyone to rescue Calicat and used Facebook to ask for help. 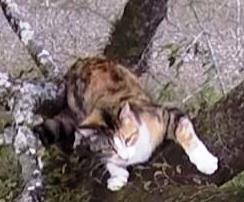 It was not until Calicat's seventh day in the tree that Toni's pleas for help finally yielded a referral to me. When I arrived, I was greeted by the other three cats and Wayne. 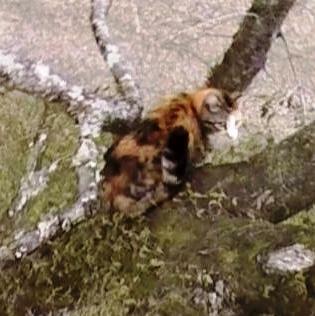 I easily spotted Calicat perched at a trunk union about 30 feet high in a tree that leaned slightly. From what Toni had already told me about Calicat's personality, I knew not to expect a cooperative kitty, and I knew that she could easily be frightened into climbing higher at my approach. Because of that, I wanted to set my rope as high as I could in the tree just to make it easier for me if she should climb higher. Also, since the tree leaned slightly, this high tie-in gave me the advantage of putting some distance between me and Calicat as I ascended. Hopefully, she would feel less threatened by me at that distance from her and allow me to go well above her. If I get above her, then I can approach her from above and keep her moving down instead of up. As it turned out, that strategy worked out very well. She allowed me to pass by as I went up the tree above her, and when I began to come down toward her, she got nervous and began to carefully climb down. In fact, I don't have any decent pictures of her because she would not let me get near her. She worked her way down the trunk several feet and then perched on the lowest branch of the tree. It was a long branch, and now I needed to make sure she did not go out any farther. I could lower myself down toward that branch and encourage her to move back toward the trunk, but I was worried that she would go up from there. Fortunately, as I lowered myself toward her, she watched and wasted no time in moving back to the trunk. For a few seconds, it appeared that she was at least considering going up, but I came back toward the trunk quickly enough to discourage that, and she began to move down instead. I watched as Calicat grabbed at the trunk and held on while moving down mostly sideways. Toni and Wayne were below ready to catch her if she should fall. Calicat inched her way down a little at a time, and I was very surprised to see her at one point begin to eat the ferns that were growing along the trunk. When cats are stressed, they don't even think about eating, but poor Calicat was starving, and she had already eaten all the ferns that were within reach from her original perch. She simply could not pass up this opportunity to grab a bite while she was surrounded by the ferns, even though they were currently in a dry and dormant state. Calicat continued to inch her way down. When she got about six feet from the ground, she tried to jump to the ground, but Toni was right there to catch her and pull her close for a warm hug. Toni carried her into the house where she gave her some water, food and some serious loving. Toni works in a veterinary clinic, so she knows what to do, and if Calicat needs more professional attention, Toni has the resources and connections to handle that. Calicat is in good hands now, and if she gets stuck in a tree again, now Toni knows who to call.